Another New Year, Another New Me? I know there are a lot of New Year cynics out there who like to belittle the idea of making resolutions for change, and believe you shouldn’t wait for the turn of the new year to make changes that are important to you, and in part I agree. But there’s something about approaching the end of a new year that makes you reflective, and I find myself thinking over the past 12 months and how the coming year might be different. Every day spent on this Earth is an opportunity for growth. Things happen every minute of every day – some small enough to go unnoticed if you’re not paying attention, some big enough to change you or your life forever. Much of life is made up of the many moments somewhere in the middle; those straight bits of track on the rollercoaster that leave you guessing whether there is a rise or a fall at the end of it. And so it stands to reason that each of us will have changed in some way over the last year. Some things will have made us stronger, happier, more content or appreciative of the life we have, some will have made us question our existence. Some things might have caused a fissure in our hearts that might make us a little more sad than we were before, and some will have broken our spirit, deeply hurt our souls, or left us alone or without loved ones. Some of us might have experienced all of those things and will be a different person to the one that started out this year. If you believe you haven’t changed at all, then know that if nothing else, you are another year older. You have survived another year in this wonderful, confusing thing called life, and are a step closer to the time you will say goodbye to it or someone in it. Time slips through our fingers like sand in a timer, except we have no idea how long our sand will last. So as much as I think it must be lovely to go through life without over-thinking the journey or the destination, I actually like to take the opportunity to consider what I have learned, and how I might allow that wisdom to change how I might live in the next year. I’m not talking about the usual stuff like stopping drinking, going on a fad diet, or pledging to join a gym (although I’d be lying if I said that choosing a healthier, fitter lifestyle wasn’t on the list somewhere). No, I’m talking about reflecting on the things that prevented me from being the person that I wanted to be, the things that happened that I had no control over, and considering how I might handle those challenges should they face me again in the year ahead. 2018 has been a strange year for me. Strange because although I know that I had lots of good experiences and special times, one event had such a negative impact on me that it has overshadowed much of the joy of the last year. If you were to ask me what the most memorable moment of 2018 was for me, it wouldn’t be the lovely week we spent at Centerparcs with our family, or the look on my children’s faces when they arrived in Disneyland Paris. It wouldn’t be the people I’ve met ‘virtually’ and helped from afar to deal with things I’ve been through, and it wouldn’t be my eldest daughter’s face when we told her we had tickets to see her favourite band, or finally getting somewhere in understanding our son and his challenges. It wouldn’t be the angiogram that our youngest daughter went through in the Spring and the day we heard her heart was looking good after three years of worry. That said, I must admit to a smile as I write these things, because I had almost forgotten some of them. No, the thing I will remember 2018 for, the thing that has sadly defined the last year for me, is the end of my 20-year career with the company that I had basically grown up working for. Redundant is an awful word. For me it says surplus to requirements, unwanted, unneeded, worthless. The dictionary definition includes words like unnecessary, superfluous, needless, dispensable, disposable. Perhaps if my personal circumstances were different, I might have seen it as an unexpected opportunity, and I guess in some respects it may be, but what it did was shake the foundations upon which my life was built, and with me being restricted to working around my children and their not insignificant challenges, I am in a state of uncertain, unpredictable limbo as I try to work out who I am or what I will do next, because I’ve never known anything else. At 43 I know that I am unlikely to give as many years to another company again, and that makes me feel sad; that one of my proudest achievements is over and will never be replicated. But, I cannot control or change what has already passed, all I can do is to work out how to take control of my future. I’m not sure how to do it yet. My self worth, confidence, pride have all been diminished by the experience, and whilst I may not know exactly how to set about rebuilding those things right now, what I do know is that I resolve to rebuild them. I cannot allow it to step across the threshold of a new year and take any more from me. And those words got me thinking about the year ahead. I guess you could call it a New Year’s Resolution – it’s a decision to take the lessons of the last year and use them to reshape me into the person I want to be going forward. In 2019, my goal is to remind myself that thoughts are not facts, and my circumstances are not who I am. I know I don’t have to have it all worked out today though, I just need to know what my goals are for the year ahead. I have a few things I would like to achieve, but I’m keeping those just for me at the moment, so for now I will just say that what I am hoping to leave 2019 with is clarity, purpose and peace. Today I took my daughter to Haworth, home of the Brontë sisters. I have always been a fan of classic literature, with Austen and the Brontë’s being right up there with my favourite writers. In fact all of my children are named because of my love of literature; Eliza (as in Bennett, Pride and Prejudice), Finlay Austen (as in Jane) and now Freya Ellis Belle (for those of you that don’t know, Emily Brontë, author of one of the worlds most renowned classics Wuthering Heights, wrote under the name of Ellis Bell for a time). Of course I was indulging myself with this trip, but I thought that while I am on a quest to make special memories with Freya, memories that will wipe out the ones I have so far, what better place to start than in the place that my inspiration called her home. It was going to be a wonderful day out, and Freya would surprisingly love it too; she was going to share my love of literature as a result of this early exposure. Oh how we kid ourselves! In reality, the day didn’t start very well. Having taken a look at the Brontë Parsonage Museum website last night I became aware that the quaint old village of Haworth wasn’t really built for my ultra-modern pram (or anything with wheels for that matter). The streets are cobbled, and the house itself has a steep staircase that renders it impossible to manoeuvre with any kind of vehicle. 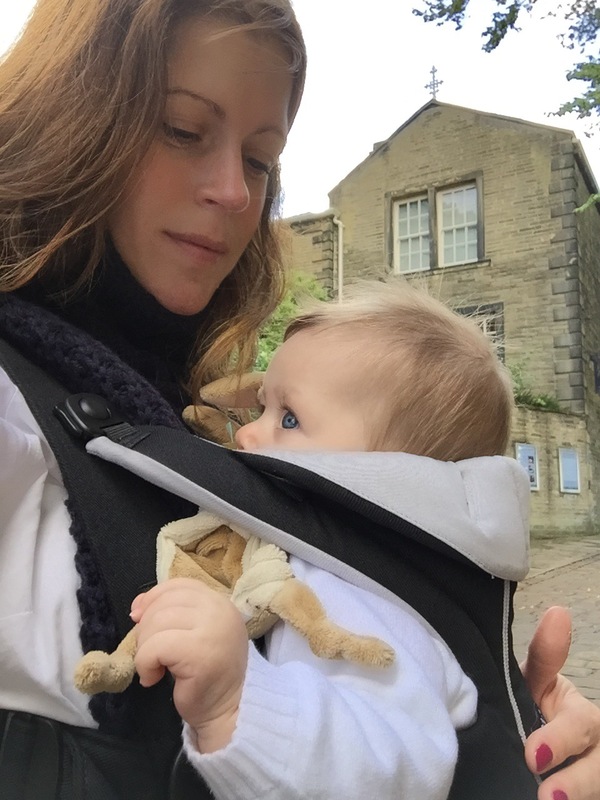 I needed a baby carrier and would have to try and get one before I set off on our road trip. After I dropped my son off at school this morning, I drove to our local Mothercare. There were about 8 different types of baby carrier on the shelf and I set about making an informed and practical decision (otherwise known as picking the nicest colour). My eye was drawn to a sling type carrier in a fetching lilac. Having asked if I could try them on, I removed it from the box and tried it on. Hmm. I have no idea how a baby is meant to be carried in one of those things. I even took Freya out of the pram for a dummy run but daren’t let go of her once I had her in it. The member of staff didn’t seem to know much about how it should fit so I decided to give it a miss. Bored of being in her pram, and now particularly peed off that I’d taken her out and put her back in again, Freya started whinging. And then crying. And then screaming. I knew she was not in need of anything – she had not long had breakfast, and had a clean nappy on – so I continued to look at the other brands and styles on the shelf. Now, I’ve never been very good with noise, particularly when I’m feeling a little anxious. And the more noise Freya made, the more anxious I became. I took another carrier out of the box but it looked like you would need a degree in engineering to work out how to get it on. I struggled for a bit, but the more I tried to read the instructions, the more Freya cried and my anxiety grew. I had such high hopes for our day and these minutes in Mothercare were minutes I couldn’t afford to lose with a 90 minute drive ahead of us. By the time a member of staff came to assist, I was in tears on the floor of the shop with open boxes around me, trying to make sense of the instructions. The lady was really sweet, and did her best to help me into the one I had chosen. Freya was still screeching. I was so embarrassed by my little meltdown that I just said I’d take it. I asked her to box it back up and take it to the counter while I took Freya to the baby room to change her and feed her. Cue stupid moment number 2 when I had to come out 2 minutes later having realised that I had left all our paraphernalia in the car not expecting to be in the shop for as long as I was. Drama aside though, I don’t know how you are supposed to safely put a baby in a baby carrier by yourself, and I’m glad I didn’t just pick one up and walk out of the shop without trying it out first. By 10:30 we were finally on our way, and although a little shaken by my emotional outburst in the baby shop, I began to look forward again to our little trip. I’d picked a nice day for it and the sun shining as we left. As we got closer to Haworth though, the heavens opened, and I couldn’t help but smile at how fitting the weather was as I drove over the Yorkshire Moors, picturing Cathy and Heathcliff running for the shelter of a tree. The sat nav kindly sent me around the block a couple of times before I found the car park, but I found it and I got easily parked. I decided to get the pram out of the boot as I had an idea that the village wasn’t far and I’d get the chance to scope it out with the pram and come back to the car if I needed to. The Tourist Information office advised me to ditch the pram, even offering to let me leave it in their shop. I took it back to the car, got Freya into the carrier with surprising ease and walked back into the village. 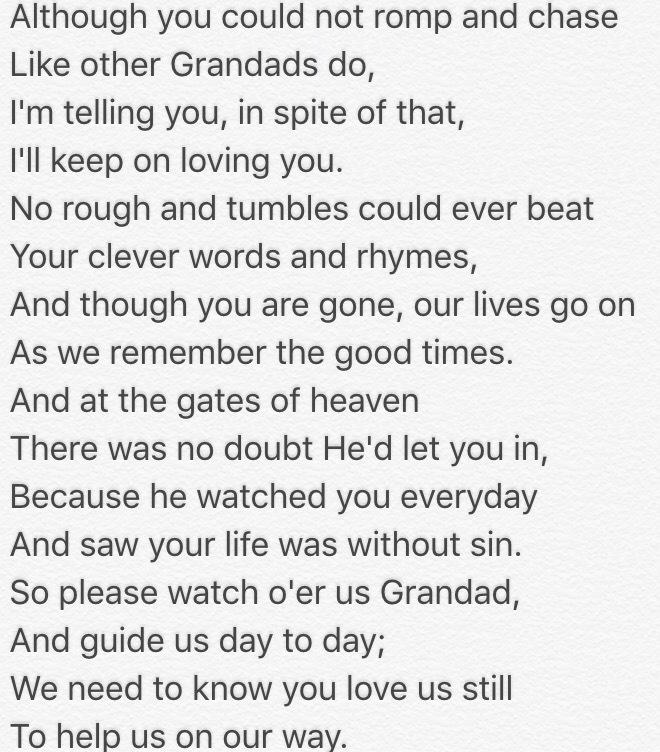 I’ve been feeling quite tearful and overwhelmed by things these days, and today was no exception. I had tears in my eyes as I walked through the village, chatting to Freya held close against my chest. We arrived at the Parsonage Museum (which has its own car park, doh!) and went inside. The man on the door was lovely and chatted to us before we had a chance to move on. He thought that it was lovely that we had named Freya after Emily, and that I had taken her there specifically to make some memories. I walked slowly and thoughtfully around the house, taking everything in. I was particularly taken by the artefacts, especially the portable writing desks belonging to Charlotte and Emily with all their trinkets. Makes you feel closer to them somehow, which is strange because they died so long ago. One of the curators came over to speak to Freya and remarked that she was about the same age that Anne Brontë was when the family moved to Haworth, and said how nice it was to hear a baby in the house. She pointed to a room across the hall, labelled ‘Charlotte’s Room’ and said that Anne would have probably had that room when she was brought there and that it might be a nice place for me to look with Freya. It was in fact the room in which Charlotte Brontë passed away, and I felt an incredible sense of sadness as I stood looking at a painting of her above the fireplace. I stood there for while, Freya stared too. And as I rocked from side to side taking the picture in, Freya drifted off to sleep. 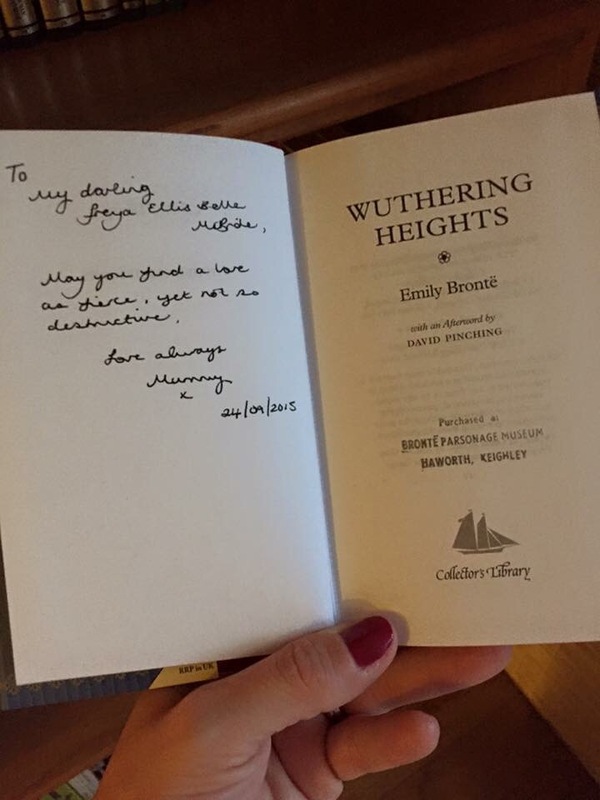 I finished off the tour, and bought a few things in the gift shop including a copy of Wuthering Heights which I planned to write an inscription in for Freya. I don’t know why my heart felt so heavy as we left. Moments like these with Freya are more special to me than any other moments in my life. I know that might sound bad because I have a husband and two other children; they are special to me too. But time with them tends to be moments of madness, of getting ready for school, of bedtime routines. I have become quite accustomed to just being with Freya. We are like two halves of a whole who are only truly content when we are linked together in some tender moment. She stares, so intently sometimes that I wonder if she can see into my soul. And I’m reminded of an earlier post, “cleansing the soul” that I wrote before all this, before KD. I am hoping that the dark cloud that follows us whenever we are trying to make new memories is something temporary, a symbol reminding me of the trauma we have been through together. Perhaps when I’ve started to get some support with how I’m feeling that grey cloud will start to dissipate and we will be allowed to have sunny days without the threat of rain.